INDIA: SECI's retendered Tranche V auction for a pared-down total of 1.2GW was oversubscribed, with 2.19GW of bids entered. 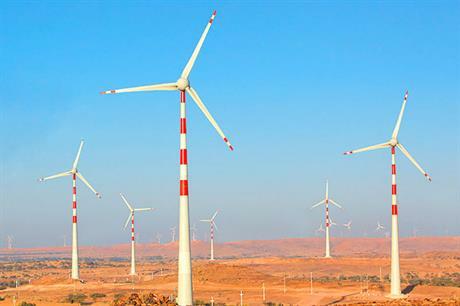 Five developers — ReNew Power/Sitac/EDF, Alfanar, Mytrah and Adani Green — each bid 300MW; Hero Future Energy and Continuum Wind entered 200MW, while Ecoren and Torrent bid 175MW and 115MW respectively. The prices bid for the available capacity are not known, but there is a strong possibility that tariffs may rise. The same Tranche V tender was originally scheduled for 2GW, but was cancelled in August and reoffered for 1.2GW — the amount of bids it had initially received. However, the sudden revival of interest in the bid comes as a surprise due to access to substations continuing to be constrained. Gujarat and Tamil Nadu, both of which are densely populated with wind farms, are already struggling with limited substation capacity and will not be able to accommodate the awarded capacity unless urgent grid expansion is carried out. For its part, the government is already moving to increase substation capacity and plans to spend $55 million to develop 10GW of transmission capacity — 5GW each in Gujarat and Tamil Nadu. However, this investment will only enable 4GW in additional capacity in Gujarat and 5GW in Tamil Nadu. It will also only enable connection of projects that have already been awarded. The new infrastructure may not support any additional new capacities that may come under the Tranche V bid or any subsequent bids. Can hybrid projects bridge lull in new wind installations?